Here in a protective case is an officially licensed Superman baseball from 1999. 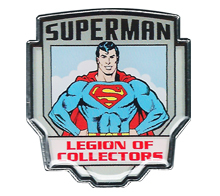 It is two-toned (red and blue) with an ’S’ symbol on the blue side and a Superman logo font on the red side. August 22, 2017 in GAMES / EDUCATIONAL / SPORTS.